William Bentinck was the youngest son of the second Duke of Portland, and was born on 14 April 1738. He attended Westminster School and Christ Church, Oxford (where he informally added ‘Cavendish’ to his surname) before undertaking a 'Grand Tour' of Europe, during the latter stages of which he was elected MP for Weobley, Herefordshire, through his family’s interests. He had made no great impression in Parliament before he succeeded to the dukedom in 1762. 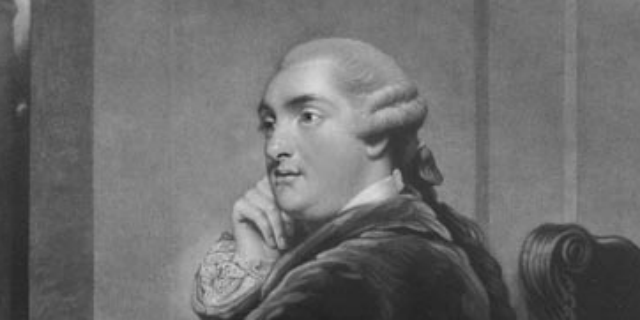 During the 1760s Portland emerged as a member of the disaffected Whig faction critical of Lord Bute’s role in George III’s government, and was rewarded with the post of Lord Chamberlain in Rockingham's ministry of 1765-6. Later in the decade he aligned himself clearly with the ‘Rockinghamite’ group of Whigs with whom he returned to office in 1782 as Lord Lieutenant in Ireland, resigning the following year when Shelburne took office on Rockingham’s death. Portland now became leader of the Whig party, and was one of the architects of the Fox-North coalition which took office in April 1783 with Portland as Prime Minister, though Charles James Fox provided crucial leadership in the Commons. Behind the scenes, however, George III resented and plotted against a Cabinet he believed had been illegitimately forced upon him, and in summer 1783 let it be known that he would welcome opposition to the ministry’s bill to reform the East India Company; its parliamentary defeat gave the King the excuse he sought to dismiss the government in December 1783. Much work was left to Spencer Perceval, who even took up residence in No. 10 Downing Street. The lack of leadership from the Prime Minister and military setbacks in the war with Napoleon in Spain and Portugal encouraged serious ministerial rivalries to develop. The failing premier’s impolitic handling generated a final crisis, culminating in Portland’s resignation and a duel between two of his ministers, George Canning and Viscount Castlereagh in September 1809. By the end of the following month, and shortly after an operation to remove a kidney stone, Portland was dead. Treaty of Paris 1783: formal end to American War of Independence.